A bestseller in Europe, The Conflict is a scathing indictment of a stealthy zealotry that cheats women of their full potential. Not surprisingly, the book is receiving tremendous attention with everyone from the New York Times, to Business Week, to the Huffington Post weighing in. That’s why I looked forward to online magazine Slate’s debate on the book. The debate involves Hanna Rosin, senior editor at The Atlantic and author of the very controversial article The Case Against Breast-Feeding, and Katie Allison Granju, who has been described as a woman who “literally wrote the book on attachment parenting.” I have been shocked and disappointed that Katie Granju has attempted to short circuit the discussion with a vicious smear of Elisabeth Badinter. Granju’s totally unsubstantiated claims about Badinter strike me as despicable discrediting of a feminist scholar to hide her inability to rebut Badinter’s arguments. Granju claims, with no proof of any kind, that no one should pay any attention to Badinter because she is shilling baby formula. Elisabeth Badinter’s job is to increase sales of baby formula. Why is no one talking about her laughable conflict of interest? Why would a leading feminist intellectual be shilling for manufacturers of baby formula? The fact that the author of a major new book asserting that breast-feeding “enslaves” and “undermines” women also personally holds controlling interest in the agency of record for the three companies that collectively control much of the infant formula market share in the United States is glaringly disturbing… Publicis has been charged with marketing Nestlé to the public since at least 1984, and has been promoting infant formula on behalf of Abbott Laboratories since 1997. Just as her views on breast-feeding may not be new with this book, neither is her revenue stream as the result of marketing infant formula. To read that one might think that Badinter works for formula manufacturers. The reality is rather different. Badinter is a shareholder in the multinational communications empire of Publicis. Her 10% stake (not a controlling interest), as a family member, makes her a billionaire. Publicis owns more than 20 different companies. Publicis includes advertising companies that represent formula manufacturers among their thousands of other clients. In other words, Granju would have us believe that that a women with decades of scholarship in the area of gender studies, a woman with impeccable feminist credentials, has engaged in one of the leading issues in contemporary mothering and contemporary feminism for no better reason than to promote increase her income. Badinter is literally a billionaire. It is simply ludicrous to suggest that her philosophy is shaped by a desire for more money. But it is a rather clever way to avoid addressing Badinter’s arguments. Curiously, given Granju’s conviction that Badinter’s personal ties make her writing on mothering worth dismissing without discussion, Granju does not disclose her own conflict of interest. Granju never mentions that she has authored a book, multiple articles and runs a blog, all efforts to promote attachment parenting. That means that Badinter is explicitly or implicitly criticizing her work. Applying the same reasoning that Granju applies means that we should not be listening to Granju. 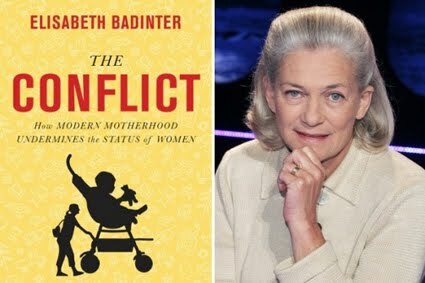 Agree or disagree with Badinter, she addresses issues of deep import to contemporary feminists and contemporary mothers. Are the ongoing attempts to moralize parenting choices and to promote biological essentialism just a new way to keep women confined to the home? After all, it is literally impossible to meet the myriad standards of AP is you work outside the home. Is that a coincidence or is that deliberate? These are issues that should engage feminists intellectuals and mothers. It is deeply disappointing that Granju has devoted very little time to addressing these issues and instead has devoted a tremendous amount of time trying to blacken Badinter’s reputation. Granju owes Badinter a very public apology.